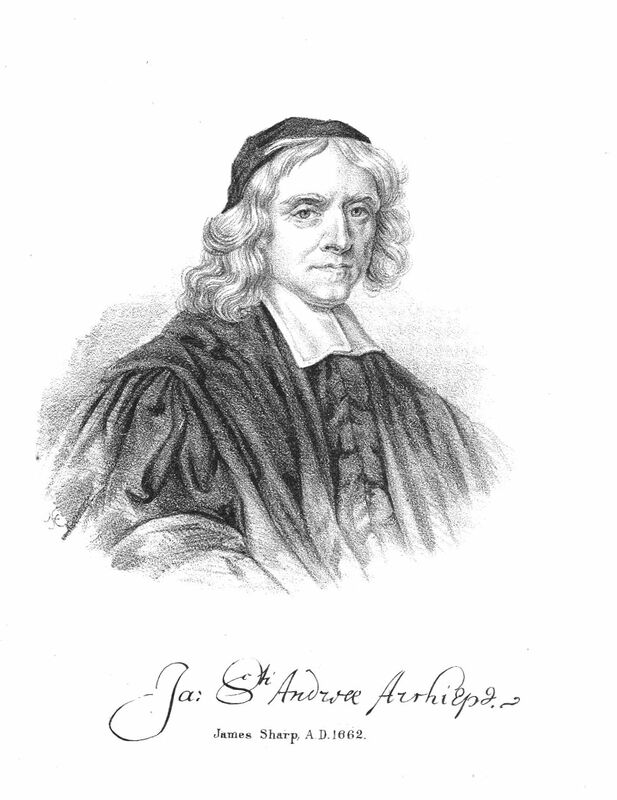 Sharp, Minister of Crail, Archbishop of St Andrews. that there would be a bloody price to pay. and London where he made contact with a body of learned Divines including Dr Sanderson, Dr Hammond and Dr Taylor. The recognition by episcopalian worthies was to stand him in good stead. more likely, reluctance to accept any responsibility to deal with such issues. He remained in England for several years until ill health prompted his return to Scotland where he first found favour with Sir James McGill, later Viscount Oxford. Through him Sharp met the Earl of Rothes and gained appointment as a Professor of Philosophy in St Leonards College, St Andrews. where he hovered on the fringe of the Court. Others would have us believe that “his labours were most acceptable, and gained the hearts of the people by calmness, condescension and affability.” Such was his intrusion into national affairs, however, that at one stage he was `advised` to go back to Scotland. But he weathered the criticism and soon became a leading figure for the moderate Presbyterians – the Resolutioners, and was their representative in London. In this role he was seen by the English as the representative of all Presbyterians, although there was no way he would pursue the interests of the breakaway Covenanters. that his contribution was rewarded by his appointment to the See of St Andrews. Privy Council announced the restoration of the Bishops. Andrews and wholely subservient to the Crown. patron and the appointment to be sanctioned by a bishop. do the hard work and determine prima facie evidence of failure by the individual to obey the church rules. civil offences having more severe penalties, including death. had not paid his fine for none attendance at church. and their arms to be fixed to the prison doors at Lanark. in Scotland, moved to the post of Lord Chancellor. King absolute control over ecclesiastical matters. colleagues and decided that assassination was the solution. accessories to the crime – there were no takers. executed in Edinburgh on 18 January 1678. In 1676 the Privy Council, no doubt influenced by Sharp, came to the conclusion that absenteeism from the churches was leading to `the decay of religion`. The fact that so many preferred Presbyterianism was beside the point. They then resorted to “A Proclamation against Conventicles”` of 1 March 1676. It ordered the prosecution of papists and other `schismatics`, the seizure of all ministers/preachers and their families who did not attend church, and the fining of all heritors and magistrates for conventicles held on their land with power to recover the fines from the culprits. Teachers and preachers were required to be licensed, informers to be rewarded as well as fines on magistrates who didnt do their job. A census was ordered of all who had taken the oath of allegiance and supremacy, and special courts commissioned to enforce these laws in the shires. The inquisition began by summoning heritors and ministers who were required to disclose any recent dealings and communication (reset) with intercommuned persons. Some gentlemen refused to declare on oath were deemed to have confessed to such meetings and were heavily fined, with imprisonment until the fine was paid. This legislation was the basis on which so many in the chain of power sought to fill their own pockets – from Commissioner Rothes, via Lauderdale, Claverhouse, Turner, the magistrates, curates, informers and spies that swarmed in the land. A commission dated 20 July 1676 created a “Committee of Public Affairs” – the Scottish Star Chamber. This consisted of the two Archbishops, Argyll, Mar, Murray, Linlithgow, Seaforth, Kinghorn, Dundonald, Elphinstone, Lord Privy Seal, President, Treasurer-Depute, Advocate, Justice Clerk, Lord Collington or any three of them. 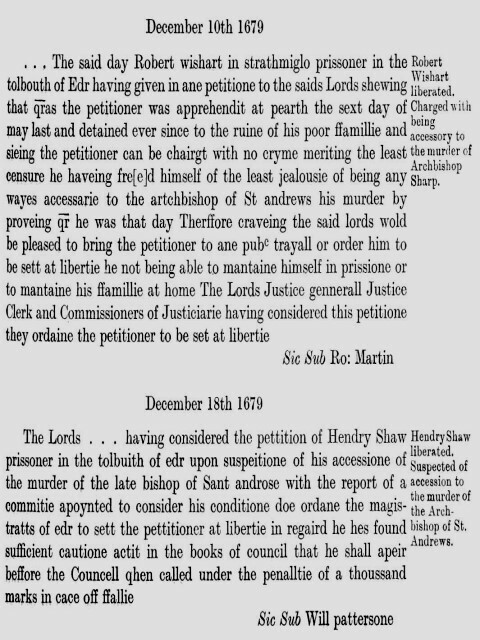 Sharp was vice chairman with plenary powers “to do all things necessary to his Majesties service.” It was the device for persecution that soon became Sharp`s personal fiefdom to pursue the Covenanters and others who fell foul of him. was the documentation that heralded the “ Killing Time “. later events would show. However, the facts were that Hackston was the tutor for a cousin`s children, and had been made responsible for disbursements made by Sharp ( from a forced sale of property for rents owed him). mounted figure of Hackston to ask for protection . Andrew Sword, John Waddel and John Clyd. It is difficult to gauge if Archbishop Sharp was as bad as he has been painted. At the time, and without benefit of hindsight, he was seemingly a morally weak man who would go with the stronger side rather than hold unto death to any great principle. He must have been reasonably clever – Cromwell called him ` Sharp of that Ilk ` and recognised his ` supple intelligence `, to have represented the Scottish Presbyterians on a number of occasions in London. That he was duplicitous is borne out by events. The Covenanter Pantheon would have that Sharp was delivered into the hands of the assassins by God`s providence – the wages of sin etc. However, there is a considerable body of evidence in sworn testaments and depositions that there was premeditation to murder both Sharp and other persecutors; and that the plan was being discussed several days before the murder took place. A letter to Donald Cargill from his brother gives a clear hint at the intention for a rebellion in conjunction with such assassinations. Indeed it was only a year before the Queensferry Papers were revealed (June 1680) and preference for a Republic was disclosed. Did he deserve to be murdered ? . We cannot, indeed must not, apply politically correct 21st century standards to events over three hundred and twenty years ago. Reality then was that no other form of justice was available to the wronged who were themselves being murdered with Sharp`s connivance. There was no independent judiciary nor process that could be used, while the Head of State was a King who himself was prejudiced against the Presbyterians. An `eye for an eye ` approach seems appropriate in the circumstances. subsequently married Cunningham of Barns, in Fife. Isabel Sharp and the servants` account of the assassination .